What is your specialty make a lot of pop up cards. I make a lot of pop up cards. When you open one up, there may be 3D fabric flowers, a large birthday cake, a tennis racquet or something pertaining to the theme of the card. 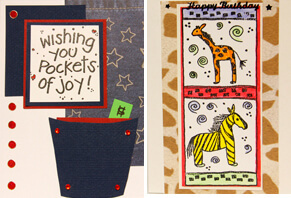 Other kinds of cards may pull up, stand up, flip it, or include a spot for a gift card. Awards, publications, recognition? Artist of the month at the Gift Shop which was featured in a Tipster article. Joanne makes cards and she tells us about how she started. “I love art. After taking classes in watercolor, pastels, and Oriental brush painting, I decided to make cards for sale again–instead of making them only for friends and relatives. “In past years, I’ve attended workshops to learn techniques such as embossing, coloring, ribbon styles, and how to make three-dimensional cards. I’m now concentrating on pop-up cards. 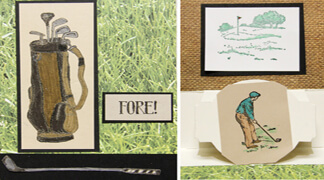 When you open one of these cards, the pop-up will fit the occasion for the card: a birthday cake, a golf bag, an animal character, a flower, or a large THANKS. For holidays, there are Easter rabbits, pumpkins, etc.